The pet food industry comprises live animal purchases, pet food, pet supplies, pet services such as grooming and boarding, and vet care. 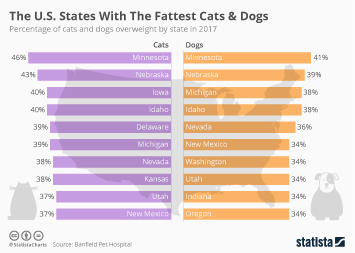 Within the pet market itself, pet food was estimated to capture the highest sales in the United States in 2017. Vet care followed with the second largest sales amount in the sector. Pet supplies and OTC medicine rounded off the leading cash-generating categories. The pet store market in the United States is a highly concentrated industry with two companies, PetSmart and PetCo, accounting for about 60 percent of the market. For both dry dog and dry cat food, private label products hold the largest share of the market, followed by Pedigree and Meow Mix, respectively. New sales-driving opportunities can be observed in grain-free foods, natural foods, and clean label pet foods. On the demand side, the two most important target groups for marketers were pet owners aged between 45 and 54 years and between 55 and 64 years. Combined, they accounted for over 48 percent of total pet store revenue in 2017. During the shopping trip for dog and/or cat food, U.S. pet owners claimed to specifically look for health label claims such as "dental/oral hygiene" or "skin/coat". Pet food sales in the U.S.
Unit sales of private label dog biscuits/treats/beverages in the U.S.
More interesting topics from the industry "Pets & Animal Supplies"